Aerate wine in seconds for better taste. 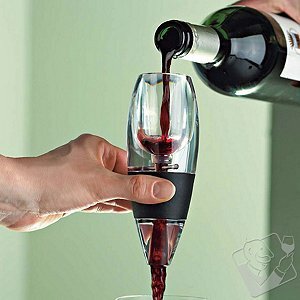 The Vinturi Red Wine Aerator is clearly on the cutting edge of wine aerating. Mixing just the right amount of air with your wine at the precise moments this see-through aerator allows your reds to breathe instantly. The Vinturi Red Wine Aerator results are a better bouquet enhanced flavor and a smoother finish. Perfect aeration in the time it takes to pour a glass. Couldn't be easier. Comes with a no-drip base. Acrylic. Aerator and base are dishwasher safe. Size: 6'H x 2' Dia.